Home » computer » PC Tricks » Why is "C" the default drive and not "A" or "B"? Did you ever notice the default drive for installation of windows is always on 'C' and not 'A' or 'B' have you ever wondered where the 'A' and 'B' gone!!! Before hard disk drives, Floppy disk drives were used as the storage devices.Floppy disk drives were the initial storage devices. They came to existence since 1960’s.Floppy disks came in two sizes 5 1/4 and 3 1/2.Those two floppy disk drives were labeled as Local Disk (A) and Local Disk (B). After the invention of Hard disk, floppy disk of size 8 inch came into existence. Floppy disk drives are replaced by the floppy disks. This is the reason behind the labeling of hard drives. 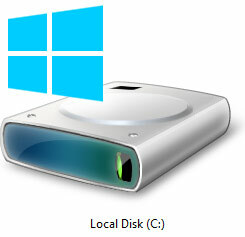 As a result, drives other than default drive (C) labeled as D, E etc. DVD drive and USB drive are labeled as F, G and so on.